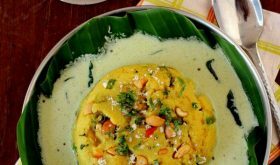 It is that time of the year when most homecooks are cooking raw mango recipes like mango chutney, pickles, pachadi, curry, rice, dal, stew, drink and more because best quality green mangoes are in season. It is no different in our home. I made a small batch of my favorite mango chutney that is popular in many parts of Northern, Western and Eastern India. It is popularly known as aam ki launji or aam ki meethi chatni. We have two mangoes trees in our backyard garden which give us enough yield to make pickles and enjoy the ripe mangoes. 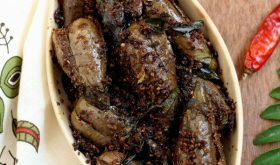 We usually make a large batch of avakai (Andhra mango pickle), sweet mango pickle and small batches of a variety of mango pickles from other regional cuisines of India like mango chutney and aam chunda. So, what is mango chutney? 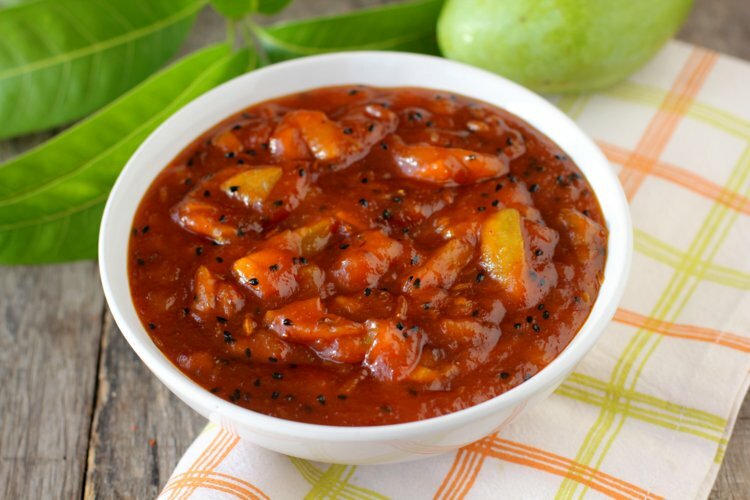 A thick chutney with chunks of soft mango that have been infused in a tempering of spices like black onions seeds, fennel seeds, asafoetida and jaggery sauce. Its all about balance, not too sweet, not too spicy and not to sour. 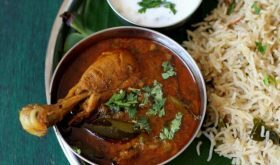 Mango chutney recipe is a simple, straightforward recipe that even a novice cook can make with ease. In fact it is one of the easiest chutney to make among the numerous Indian food chutney varieties. Its best to use a slightly ripe (very slight) mango and the second best would be a perfect raw mango just plucked off the tree. 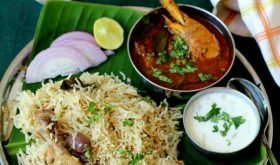 There are slight variations to the basic mango chutney recipe based on the region it is prepared. Whatever version one makes, the sour, fruity aroma of mango chunks simmering in the spiced sauce cannot be described but can only be experienced. The irresistible mango chutney has many uses and can be served as a dip, spread, condiment, relish or pickle. 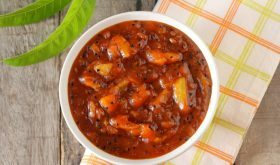 Some of my favorite ways to relish this sweet mango chutney is with paratha or roti, as a spread on crackers or mathri, toasted multi grain bread, sandwich spread and kathi roll. I also use it as a salad dressing along with vinaigrette for summer salads like cole slaw, som tum or sprouts. I like to perk up oats and yogurt with a heaped tablespoon of mango chutney. You must try it too. 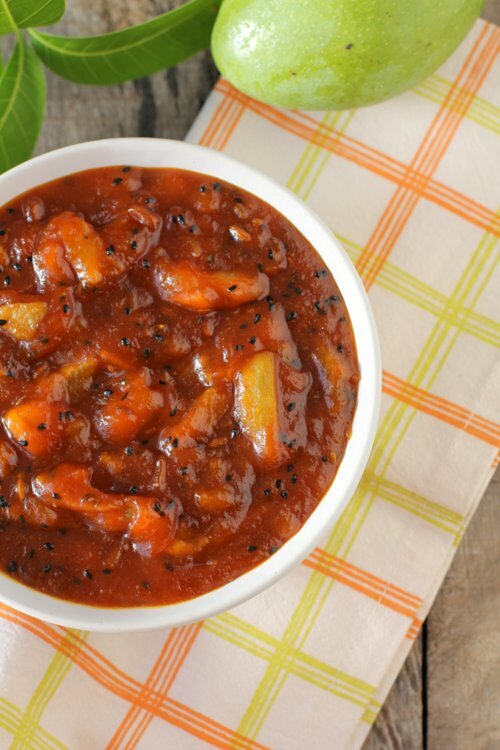 At parties you can serve mango chutney along side tomato salsa to go with nachos and chips. If you like grilled chicken or shrimp, you can serve mango chutney with it too. ~ Use medium sour raw mango. 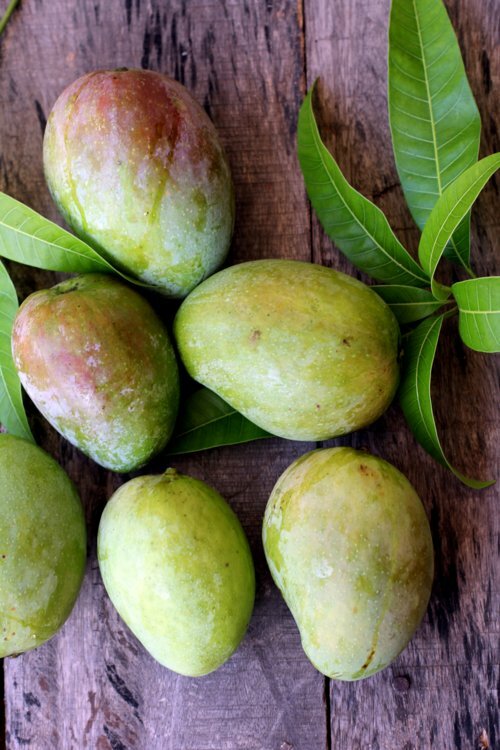 If the mango is too sour, allow it to ripen for 2 days and then use to make mango chutney. Peel and chop mangoes into slighly large chunks or thin wedges. ~ I used Kashmiri red chili powder which gives a deep red shade to the chutney. You can use store bought red chili powder which is generally used to make pickles. ~ I used organic jaggery that is soft. You can grate or pound the jaggery. Sugar can replace jaggery or gud. If using sugar, use 1 1/4 cups. Increase sugar quantity after testing the flavor of the chutney while it is simmering. Wash the mangoes, dry and peel them. Chop them into bite sized pieces or wedges. Set aside. 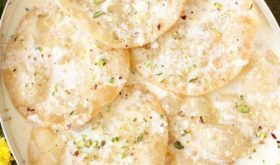 Grate the jaggery or pound it into small pieces. Set aside. Heat oil in a heavy bottomed vessel and once hot, add methi seeds and allow to turn red. Next add black onion seeds, fennel seeds and cloves and allow to splutter and saute for few secs. Next add the mango pieces and mix. Add turmeric powder and mix. Cook for 2 mts on low medium flame. Place lid, reduce flame to low and cook the mangoes in their own steam for 6-7 mts. Next add red chili powder and salt and mix. Add water and place lid. Allow the mangoes to cook till almost done and chunks of mango are visible. This could take about 15-18 mts. Add the jaggery and mix well. You will notice that the jaggery leaves water and the consistency of the chutney is thin. Cook without lid for another 10 mts or till the jaggery has completely melted and the sauce is getting thick. Add red chili powder, roasted cumin powder and salt and mix well. Turn off flame and allow to cool. On cooling it will thicken. Once the chutney has cooled, transfer to a sterilized air tight bottle and refrigerate for a few weeks. Serve as a dip, spread or relish. Mustard oil is best. If using mustard oil, heat it to smoking point and turn off flame. Add the spices and allow to splutter and then turn on the flame to low and follow rest of the procedure. You can add 1 tsp of cumin seeds at the time of tempering. You can omit black salt if you do not have it on hand. Increase salt by 1/2 to 1 tsp. If mangoes are sour, add more salt. Sugar or cane sugar can be used in place of jaggery. Start with 1 1/4 cups sugar and taste the sauce while its simmering. If more sweet is required, add more sugar accordingly. Always add sugar or jaggery when the sauce is simmering and not after the chutney is done.